How to choose a wall fan for your home or business? 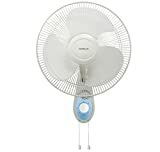 There is no dearth of fan manufacturers in India and most of them have wall fans in their product lines. It is important to remember that the higher price of a particular product does not guarantee its quality nor is it a good idea to compromise on quality just so that you can save a little money. The best thing to do is therefore make an informed choice when purchasing a wall fan. Little floor space: The fact that they don’t take up any floor space could be a wonderful thing if you want to use it for a small room or even for your business premises. Saves electricity: If the air conditioner is your mode of keeping cool, you will find that a wall fan saves you a lot of electricity every month. Corner cooling: It offers direct cooling and can be perfect for corners and passages which need more cooling. RPM : 2400; Power Consumption: 60 Watts,High speed RPM motor with 100% copper winding & 100 % make in India . Keeping in mind a few things when you are shopping for a wall fan will help you make a good choice. Build quality: Excellent build quality is essential. Lightweight is perfect for homes and small businesses but if you are buying for industrial purposes, then choosing a heavyweight product will ensure better performance. Size: Buy a size that fits into the room you are buying for. Compromising as far as size is concerned is not a good idea because then you will be compromising on cooling too. Mounting arrangement: It is essential to consider the mounting arrangement before you buy a wall fan. If it’s a temporary wall, don’t buy a heavy wall fan for it. It is best to go with a fan that is right for a particular wall. Speed: Speed control is another good feature to have. It will let you control the speed at which you want the fan to run and if this can be done with a remote control, then it is the best buy. Fans are crucial appliances in homes and businesses and therefore buying from a reputed company makes sense. Here are some brands you could choose from in India without any worries. Orient: This company makes stellar wall fans with strong functionalities. From ceiling fans to wall fans and everything in between, you will have something to your liking. Usha: This is a brand that has a loyal following among fan-buyers in India. It has a good selection of wall fans in different capacities. 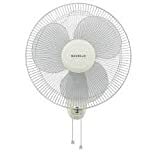 Havells: This modern brand has a stunning selection of aesthetically appealing wall fans. One of these is sure to add a touch of glam to your property. Khaitan: This is a company that has been manufacturing and selling excellent fans in India for decades. It has a good range of wall fans for you to choose from.